Understand the difference between standards, objectives, and purpose statements, and craft the latter in terms that students can easily grasp. Involve students in understanding and "owning" the purpose of every lesson. Motivate students by conveying the relevance of content to students' lives. Develop classroom activities and assessments that allow students to demonstrate both their mastery of lesson content and their understanding of the lesson’s core purpose. From initiating lesson plans to evaluating student work, all aspects of lesson development and implementation are discussed in this lively and practical book. 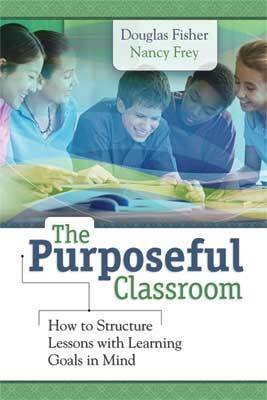 Filled with specific examples of effective purpose statements, assignments, and tests across grade levels and content areas, The Purposeful Classroom is essential reading for all teachers who want their students to truly understand what they are learning and why. "The focus of The Purposeful Classroom is on creating clear and meaningful purpose statements for students, and then supporting work toward these goals. . . .
"I appreciate [Fisher’s and Frey’s] continuing commitment to walk their talk by staying involved with high school teachers and students. This sets them apart from many of the “expert” voices in education who have either no experience (or, at least, no relevant recent experience) working in classrooms. Fisher’s and Frey’s deep background knowledge shows throughout the book in the form of the personal stories they share. As a teacher, I really connect with that approach." DOUGLAS FISHER is a professor of language and literacy education in the Department of Teacher Education at San Diego State University and a teacher leader at Health Sciences High & Middle College. He is a member of the California Reading Hall of Fame and is the recipient of a Celebrate Literacy Award from the International Reading Association, the Farmer Award for Excellence in Writing from the National Council of Teachers of English, and a Christa McAuliffe Award for Excellence in Teacher Education from the American Association of State Colleges and Universities. NANCY FREY is a professor of literacy in the School of Teacher Education at San Diego State University and a teacher leader at Health Sciences High & Middle College. Before joining the university faculty, Nancy was a special education teacher in the Broward County (Florida) Public Schools, where she taught students at the elementary and middle school levels. She later worked for the Florida Department of Education on a statewide project for supporting students with disabilities in a general education curriculum.